Fairborn junior LeeAnn Williams (6) hits the ball just over Xenia’s block attempt to score a kill in the third set, Oct. 11 at Fairborn High School. 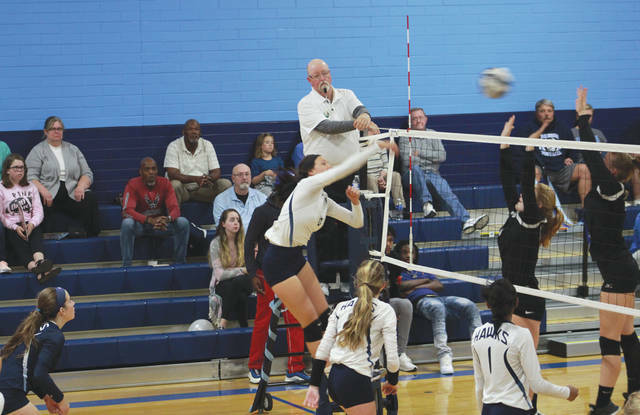 FAIRBORN—The Fairborn Skyhawks volleyball team learned from their past defeat and made the necessary adjustments to defeat the Xenia Buccaneers in a game that determined the division title winner. The Skyhawks won the GWOC American South Division over the Xenia Buccaneers by a score of 25-21, 19-25, 25-19, 25-14. The last time these two teams met, Xenia won the match in four sets. The Skyhawks were determined not to let that happen again. The Skyhawks (9-12, 7-7 in the GWOC South) studied film and the coach even talked to West Carrollton to see what they did two days earlier to beat Xenia (9-12, 6-8 GWOC South). The adjustments showed as the Fairborn team looked to be the stronger one for most of the night. The Skyhawks regularly were in good position to defend Xenia’s offense while Xenia struggled to contain multiple hard spikes from the Skyhawks. Fairborn Junior LeeAnn Williams led the team with 12 kills while junior Hani Sampson pitched in 11 kills of her own. Freshman Katie Knapp had 33 assists. For Xenia, Skylar Throup led the way with nine kills. The Skyhawks will look keep things rolling in the postseason tournament. They are set to face West Carrollton in their first postseason game. With one season goal accomplished, the team turns its focus to the future. For Xenia, the team will look to brush off the loss and rebound. https://www.fairborndailyherald.com/wp-content/uploads/sites/50/2018/10/web1_WilliamsSpike_PS.jpgFairborn junior LeeAnn Williams (6) hits the ball just over Xenia’s block attempt to score a kill in the third set, Oct. 11 at Fairborn High School.